Trek duration: 11 nights and 12 days. Trek start/end: Fly in and out at Lukla Airport. Trek grade: Difficulty due to high alititude. Trek season: Middle of September to middle of June. Highest elevation: Gokyo Ri 5357m. Ethnic group: Majority of Sharpa community. Villages: Phakding, Namche, Khumjung and Khunde etc. Views points: Mong La and Gokyo Ri. Himalayan scenery: Kwangde, Thamserku, Tabuche, Cholatse, Ama Dablam, Nutpse, Lhotse, Everest, Cho Oyu, Makalu, Machhermo Peak, Gechungkan and Kyajo Ri etc. Gokyo Lakes: 1st to 6th Lakes into the Gokyo valley. 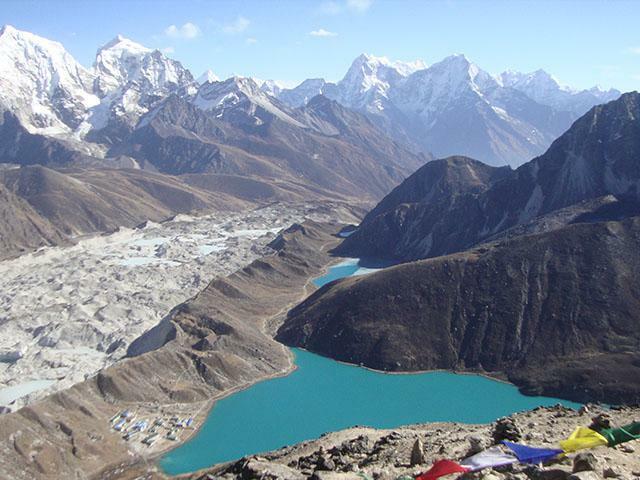 Gokyo Lake Trek is in the Sagarmatha National Park in the Everest region. It is scenic trekking into the Gokyo valley and Gokyo Ri. When we hike up to the Gokyo valley, there are opportunities to explore the bright turquoise – Gokyo Lakes (1st to 6th) and the largest Nagozumba glacier in the Himalaya and also ascends to Gokyo Ri (5357m) for snapping superb view of four above 8000m peaks: Everest, Lhotse, Makalu and Cho Oyu. The journey begins with a flight to Lukla from Kathmandu. The first part of the journey from Lukla to Namche Bazaar and a side trip to Everest view Hotel, Kumjung, and Khunde villages where can see rich culture of Sherpas. Then, we head up to Mong La, Dole, Machhermo and Gokyo Lakes on the less crowded trail compared to Everest Base Camp. The Musk Deer, Himalayan Thar (mountain wild goats) and Pheasant (Nepali national bird might see en-route of Gokyo valley trek. We come back to Lukla via the same route when we are descending. Gokyo Lakes is located at an elevation of 4700m to 5000m in the Everest region. This is one of the highest freshwater Lakes in the world. Gokyo Lake (3rd Lake – Dudh Pokhari) is the main attraction in this region covering an area of 42.9 ha (106 acres) which is sacred to both Hindus and Buddhist. The pilgrims visit the Lake in the Janai Purnima festival full moon August. There are six Lakes in the valley, north along the Nagozumba glacier to Mt. Cho Oyu Base Camp. There are teahouses at Gokyo Lakeside (third Lake). There are splendid views of Mt. Cho Oyu and Gyachungkang from 4th Lake (Thonak Tsho). There is a viewpoint on the top of some moraines right above the Gokyo fifth Lake (Nagozumba Tsho) that gives splendid views of the biggest mountains including Everest, Lhotse, and Cho Oyu. Our guide leads you till the fifth or sixth Lakes (Gyazumba Tsho) to the end of Gokyo valley or base of Mt. Cho Oyu (8201m). Day 01: International Airport pick up. Our company representative helps you transfer to the Hotel from the Kathmandu International Airport. Day 02: Trek beriefing, prepartion and visit to Sawayambunath (monkey temple). 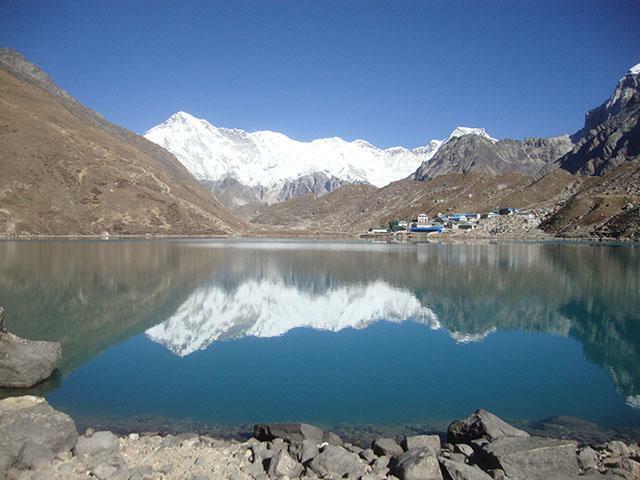 We brief about day by day trek schedule and necessary gears for the Gokyo Lake Trek. Then, visit Sawayambunath (monkey temple) in the afternoon. Day 03: Lukla to Manju 2840m/4hrs. We fly to Lukla in the morning. We follow the trails to Phakding village 2610m by descending to the Dudh Kosi River and pass many stones, boulders carved with Tibetan Buddhist prayer inscriptions. We continue to walk along Dudh Kosi green valley and stop at Manju 20840m village. Day 04: Manju to Namche 3440m/4-5hrs. Soon, we pass the Sagarmatha National Park check post at Manju. Then, we descent to Jhorsale village. There is a steep climb to the high bridge (Hillary bridge). We continue ascending to Top Danda where we get the first glimpse of Mt. 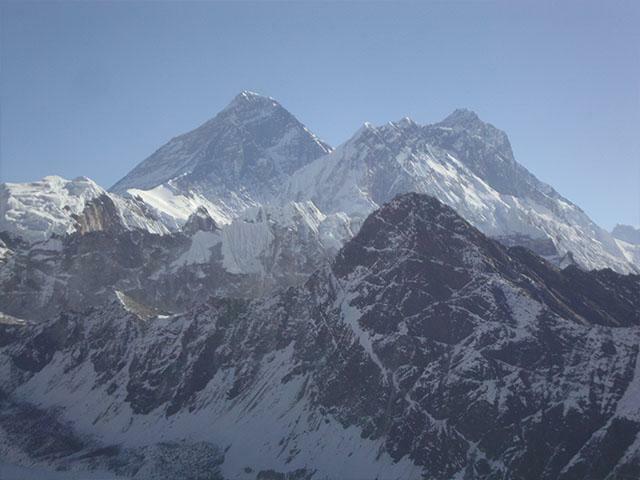 Everest and Lhotse. Then, we walk into the pine and Rhododendrons trees to get up Namche Bazaar. We do a day hike to Everest View Hotel, Khumjung school (Hillary school), visit the monastery to see Yeti skull and then continue walking to Khunde village and hospital before we are descending to Namche for a second night. Day 06: Namche to Mong La 4000m/4hrs. On leaving Namche, we can take an easy way to Kyangjungma which has a fabulous view of Khumbu valley, Mt. 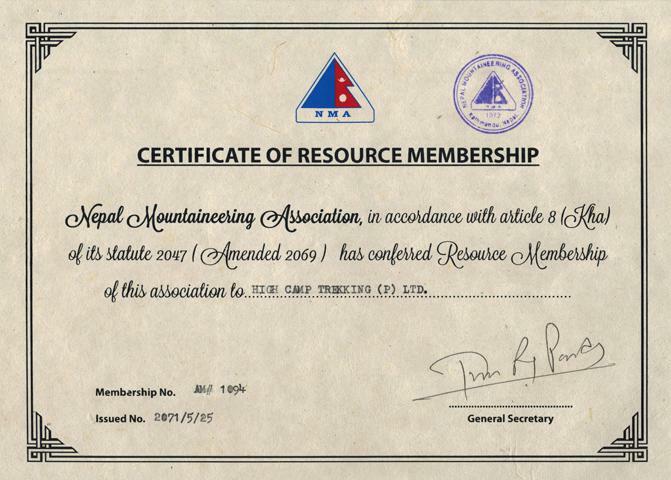 Ama Dablam, Everest, Lhotse and Peak 38 etc. There is an uphill walk to Mong from Kyangjungma. Mong La is in the hilltop where was born Lama Sange Dorje who introduced Buddhism in the Khumbu valley. We can see Sunset on Mt. Ama Dablam if it is clear weather. Day 07: Mong to Dole 4100m/4hrs. Soon, we descend to Photse Thanga an hour. Then, we climb up through Pine and Rhododendrons trees to get up Dole village. We might see Musk deer and Himalayan Thar (mountain goats) in this trail. Day 08: Dole to Machhermo 4410m/4hrs. We do hike to Lapharma, a steep climb up about 45 minutes. Then, there comes an easy way to Luza and Mechhermo village where we get an amazing view of Mt. Cho Oyu, Tabuche, Kangtenga and Thamserku, Kyajo Ri and Machhermo Peak etc. Sherpas believe that Yeti is hiding around Machhermo. The Yak was killed and a young Sherpa girl was pushed by Yeti about 40 years ago. Day 09: Machhermo to Gokyo Lake 4800m/4-5hrs. We hike above tree-line along Dhudh Kosi River that is originated from Gokyo Lake and Nagozumba glacier. The continuous journey takes us to witness the first, second and third Gokyo Lakes. There are teahouses at Gokyo Lakeside (3rd Lake). Gokyo valley is dominated by Cho Oyu (8201m) which we see from Gokyo Lakeside. Day 10: A day hike to 4th, 5th and 6th Lakes. We do a day hike to 4th, 5th and 6th Lake on the remote upper part of the Gokyo valley. There is splendid views of Mt. Cho Oyu, Everest, Lhotse, Nuptse and Nagozumba glacier etc. This is an adventurous walking in the high altitude. We hike up to Gokyo Ri (5357m) in the morning. It is even more adventurous for 3 hours. We can witness dramatic views of four above 8000m peaks: Mt. Cho Oyu, Everest, Lhotse and Makalu, and heavenly Gokyo Lake and Nagozumba glacier from Gokyo Ri. It is one of the best Himalayan viewpoints in the Earth. We back to the teahouse and pack the bag and descend to Dole by passing Lakes and Machhermo village. Day 12: Dole to Namche 3440m/5-6hrs. We descend to Phortse Thanga and then, climb up to Mong La. We do a tea break at Mong with its fantastic views of Ama Dablam and Khumbu valley. Then, we continue walking to Namche Bazaar. Day 13: Namche to Lukla 2840m/7hrs. We do downhill hike through Rhododendrons and Pine trees to Jhorsale. Half an hour uphill walk lead to Manju where National Park is the exit. We continue walking to Lukla by passing Bangker, Phakding, Ghat and Chaurikharka villages along the Dudh Kosi valley. Day 14: Lukla to Kathmandu by flight. We fly to Kathmandu in the morning. It is half an hour scenic flight. We arrange transfer to Hotel from Airport. Day 15: Visit Boudhanath and Pashupatinath. We arrange a guide on your request if you are interested in guided sightseeing tour to Boudhanath and Pashupatinath (buffer day for Lukla flight). Day 16: Visit Patan and Bhaktapur. We arrange a guide on your request if you are interested in guided sightseeing tour to Patan and Bhaktapur (buffer day for Lukla flight). Day 17: International Airport departure. We arrange International Airport transfer. Note:- Request a costum itinerary. The itinerary can be changed for an interesting side trip and additional acclimatization days if needed while on the trek. 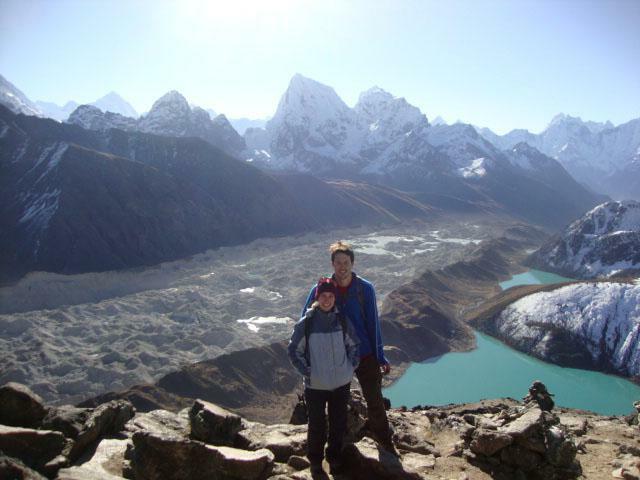 Do you have any questions regarding Gokyo Lake Trek? Or would you like to see how it can be customized to your needs? Please DM us. The following cost and date are for per person for online booking. If the Gokyo Lake Trek departure dates do not match for you, please DM us and we will happily customize your trip on the date that you need. International & domestic Airport pick up and departure. 2 nights accommodation (standard twin bed room with breakfast) at 2** Hotel in Kathmandu. Note:- The accommodation in Kathmandu can arrange/book according to client choice Hotel type. The clients have to pay differences if needed. Teahouse meals for clients: 12 Breakfasts, 11 Luches and 11 Dinners with tea/coffee etc. Meals can be selected from menu and will have enough daily. 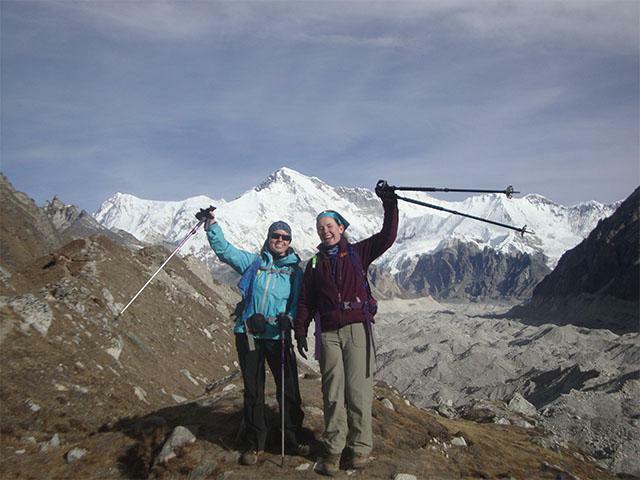 Trekking staffs: an experienced guide and porters. Salary and meals for guide and porters. Inusrance of guide and porters. Please read carefully cost includes and does not include above. All the meals are included with tea/coffee while on the trek. We do not include drinking water or boil water which you can buy at teahouse; this is $1 to 3 per liter. You can take water purified tablets or Seripen for a cheaper solution. Wi-Fi, battery charge and hot showers are not included. Wi-Fi is $20 for 10GM and $30 for 20 GB for per card. Battery charge is $3 to 10 per device (you can take power bank for a cheaper solution) full charge. The gas shower is USD3 to 7 per head. In case Lukla flight is canceled due to weather condition, you are responsible for extra Hotel nights and meals in Kathmandu and Lukla for any extra days. Do not require an extra payment for rescheduling Lukla flight due to canceling of weather. But, there can be less priority for flight cancel passengers on the following day. If there are unexpected circumstances such as flight cancellation due to weather condition, we offer you an alternative trip. Gokyo Lake Trek is in the Sagarmatha National Park in the Everest region. It is a scenic trekking into the Gokyo valley and Gokyo Ri. When we hike up to the Gokyo valley, there are opportunities to explore the bright turquoise – Gokyo Lakes (1st to 6th) and the largest Nagozumba glacier in the Himalaya and also ascends to Gokyo Ri (5357m) for snapping superb view of four above 8000m peaks: Everest, Lhotse, Makalu and Cho Oyu.The journey begins with a flight to Lukla from Kathmandu. The first part of the journey from Lukla to Namche Bazaar and a side trip to Everest view Hotel, Kumjung, and Khunde villages where can see rich culture of Sherpas. Then, we head up to Mong La, Dole, Machhermo and Gokyo Lakes on the less crowded trail compared to Everest Base Camp. The Musk Deer, Himalayan Thar (mountain wild goats) and Pheasant (Nepali national bird might see en-route of Gokyo valley trek. We come back to Lukla via the same route when we are descending.<strong>Gokyo Lakes:</strong>Gokyo Lakes is located at an elevation of 4700m to 5000m in the Everest region. This is one of the highest freshwater Lakes in the world. Gokyo Lake (3rd Lake – Dudh Pokhari) is the main attraction in this region covering an area of 42.9 ha (106 acres) which is sacred to both Hindus and Buddhist. The pilgrims visit the Lake in the Janai Purnima festival full moon August. There are six Lakes in the valley, north along the Nagozumba glacier to Mt. Cho Oyu Base Camp. There are teahouses at Gokyo Lakeside (third Lake). There are splendid views of Mt. Cho Oyu and Gyachungkang from 4th Lake (Thonak Tsho). There is a viewpoint on the top of some moraines right above the Gokyo fifth Lake (Nagozumba Tsho) that gives splendid views of the biggest mountains including Everest, Lhotse, and Cho Oyu. Our guide leads you till the fifth or sixth Lakes (Gyazumba Tsho) to the end of Gokyo valley or base of Mt. Cho Oyu (8201m). Please read carefully the terms and condition to book a package trip. Once you agreed with term and condition; payment is an unavoidable part of the agreement. The following are different methods of trip booking advance payments for your convince. 2) If you like to transfer the deposit b Western Union, MoneyGram, and IME, you can use our company owner/manager name:- Norsang Lama. We organize group joining basis trip. Our package is with all-inclusive prices (no hidden cost). We customize the trip itinerary based on your interesting side trip, holiday's length and activities as you need. Lets us know your holidays' length.